The iconic structure has survived through the ages despite centuries of upheaval. Ryazan Kremlin, south view. Background: Cathedral bell tower, Dormition Cathedral. Foreground: wall of Transfiguration Monastery with West Gate&Church of St. John, Transfiguration Cathedral (right). Aug. 28, 2005. 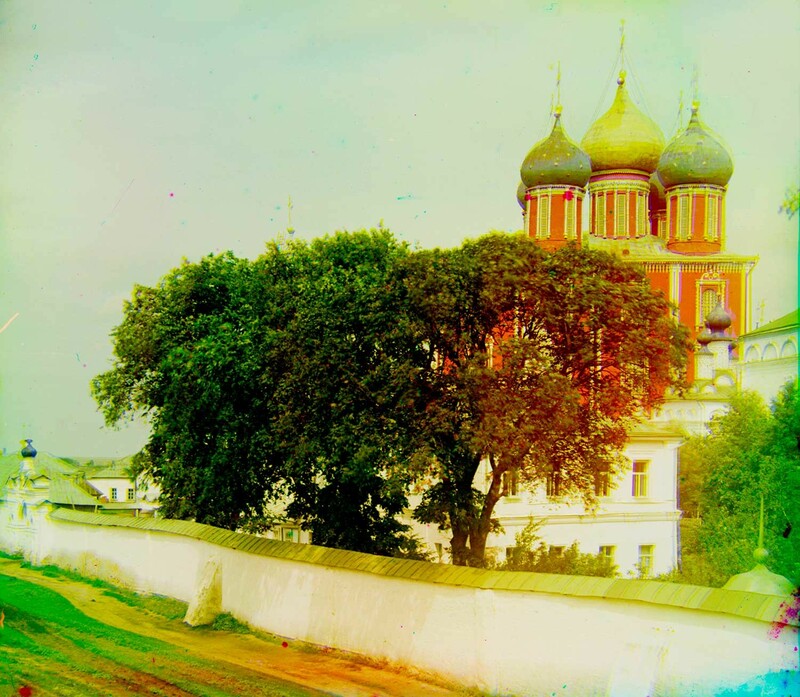 At the beginning of the 20th century, the Russian chemist and photographer Sergei Prokudin-Gorsky developed a complex process for vivid color photography (see box text below). 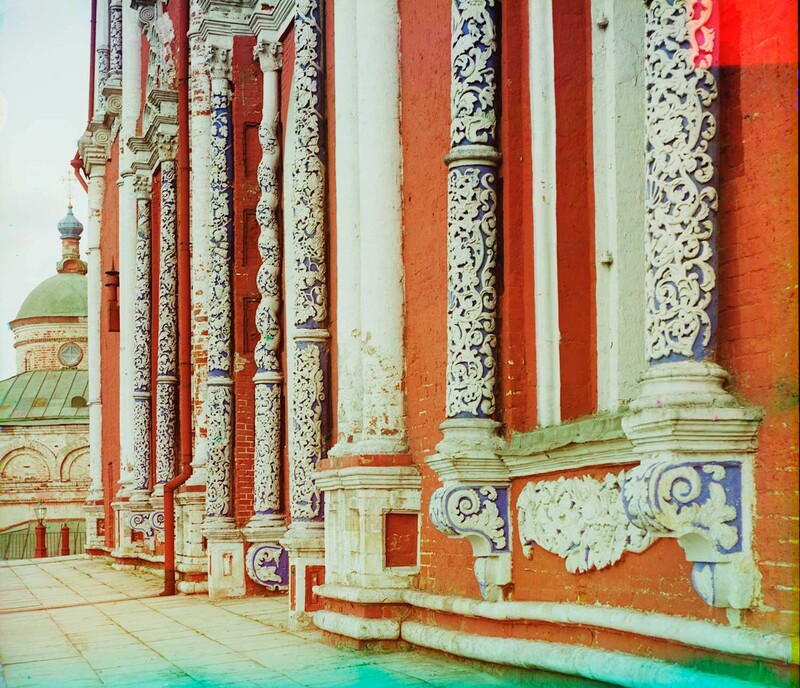 His vision of photography as a form of education and enlightenment was demonstrated with special clarity through his images of architectural monuments in the historic sites throughout the Russian heartland. In summer 1910, Prokudin-Gorsky made a series of journeys along the Oka River, a major tributary of the Volga. 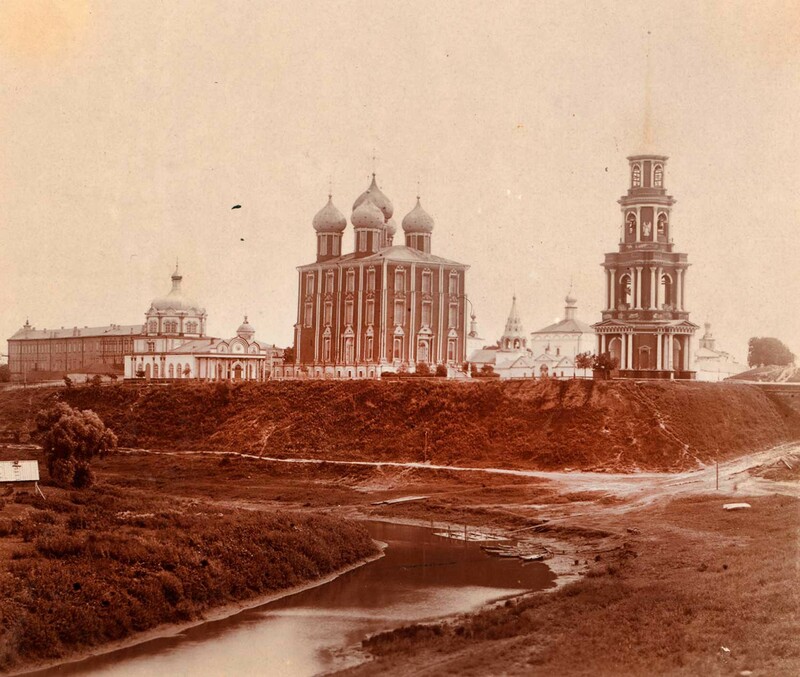 During these trips, he took numerous photographs in Ryazan, 190 km southeast of Moscow. My photographs of the town were taken over an extended period from 1984-2006. Ryazan Kremlin. Background: Dormition Cathedral. Foreground: wall of Transfiguration Monastery, Transfiguration Cathedral (far right). Summer 1912. At the time of Prokudin-Gorsky’s visit, Ryazan had a population of around 45,000. Today it is a growing city with a population of over half a million. 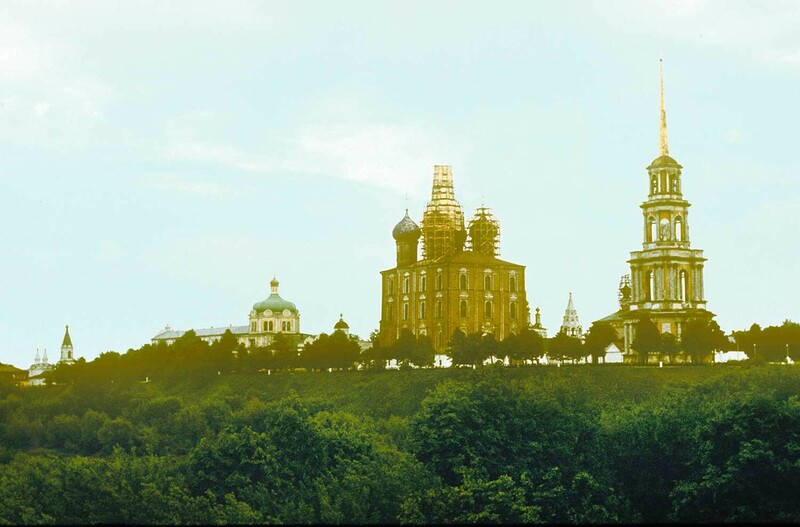 Known for its historic monuments, the Ryazan kremlin has one of Russia’s most imposing cathedrals at its center. Few of the ancient cities of the Russian heartland have endured a more turbulent history than Ryazan. Already an important town in the 11th century, by the middle of the 12th century Ryazan had become the center of a major principality that held sway over extensive territory in the Oka River basin. It had massive earthen-wall fortifications, portions of which have survived to the present as one of the largest archeological sites in Russia. Ryazan Kremlin, northwest view. From left: Archbishop's Palace, Cathedral of Nativity of Christ, Dormition Cathedral, Epiphany Church, Transfiguration Cathedral, bell tower. Summer 1912. In 1237, Ryazan was devastated by the Mongols, and attempts to re-establish settlements in the immediate area were undercut by Tatar raids over the following decades. By the 14th century, the local church and political leadership decided to re-establish Ryazan at the better-defended settlement of Pereyaslavl, 55 km northwest at the point where the small Trubezh River empties into the Oka. For centuries, the town was known as Pereyaslavl-Ryazansky. By the beginning of the 15th century, Pereyaslavl-Ryazansky had a large fortress (kremlin) whose earthen ramparts are well preserved. Prokudin-Gorsky and I both photographed the kremlin from the northwest, but his view - available only in a contact print - shows the Trubezh River more clearly. Ryazan Kremlin, northwest view. From left: Church of Holy Spirit, Archbishop's Palace, Cathedral of Nativity of Christ, Archangel Cathedral, Dormition Cathedral, Epiphany Church, Transfiguration Cathedral, bell tower. May 13, 1984. Although the threat of Tatar raids eventually waned, the region was afflicted by famine and disease at the end of the 16th century and wracked by violent disorders in the early 17th century during the dynastic interregnum known as the Time of Troubles. In 1778, the town was designated simply Ryazan. The city's greatest monument is the Cathedral of the Dormition, whose name derived from the 12th century cathedral of the same dedication in Old Ryazan. 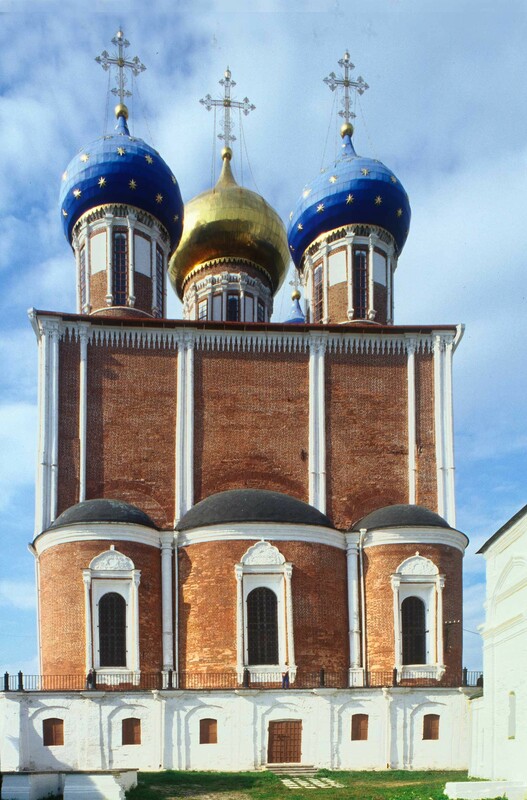 At the turn of the 15th century, a masonry cathedral dedicated to the Dormition was erected in Ryazan. In the early 1680s, Metropolitan Pavel of Ryazan (served from 1681 to 1686) undertook to build a much larger cathedral to meet the needs of an expanded diocese. Work began in 1684, but the completed structure, poorly built, collapsed on an April night in 1692. Ryazan Kremlin. Dormition Cathedral, west facade. Summer 1912. After the initial debacle, the project was entrusted by the next metropolitan, Avraamy (who served from 1687 to 1700), to the renowned architect Yakov Bukhvostov. Like his hapless predecessors, Bukhvostov faced serious challenges with the foundations and the roof vaulting for the immense structure. He was also involved in other projects at the time and faced court litigation on one of them. Nonetheless, with the assistance of local master builders, the structure was completed in 1699. Another three years were spent on its interior, including the construction of a large icon screen. In August 1702, the cathedral was consecrated by a third metropolitan, Stefan Yavorsky (1658-1722), who became one of the leading prelates of the Russian Church during Peter the Great’s reign. But the travails of the building were not over. Thanks to its exposed location and height, the roof and cupolas, as well as the upper windows, were frequently damaged. The structure itself seemed under threat because of leakage and resulting cracks in the walls. In 1800, the Holy Synod in St. Petersburg issued a directive stating that the structure should be demolished and rebuilt. Ryazan Kremlin. Dormition Cathedral, west facade. May 13, 1984. Fortunately, Metropolitan Simon of Ryazan (bishop from 1778 to 1804) decided to consult with the local council and, with the support of wealthy merchants, marshaled the resources to undertake fundamental repairs. Russia’s architectural heritage benefited immeasurably from the wisdom and diplomacy of an experienced bishop. Alas, Simon died in January 1804, a few months before the reconsecration of the cathedral in August. The Ryazan Dormition Cathedral represents one of the most distinctive designs in the history of Russian church architecture. Over 40 meters tall with five large drums and cupolas as well as extensive window space, the structure is balanced on a complex system of cellar vaults, which also support a terrace platform for the cathedral. The cathedral's roofline was designed as a horizontal cornice with decorative brick patterns. Ryazan Kremlin. Dormition Cathedral, north facade. Carved limestone columns. Summer 1912. The tall windows were framed with carved limestone columns and pediments. The 5,000 blocks comprising the limestone details were standardized, thus enabling the architect to complete the structure within six years, a relatively short period in view of the complexity of the project. 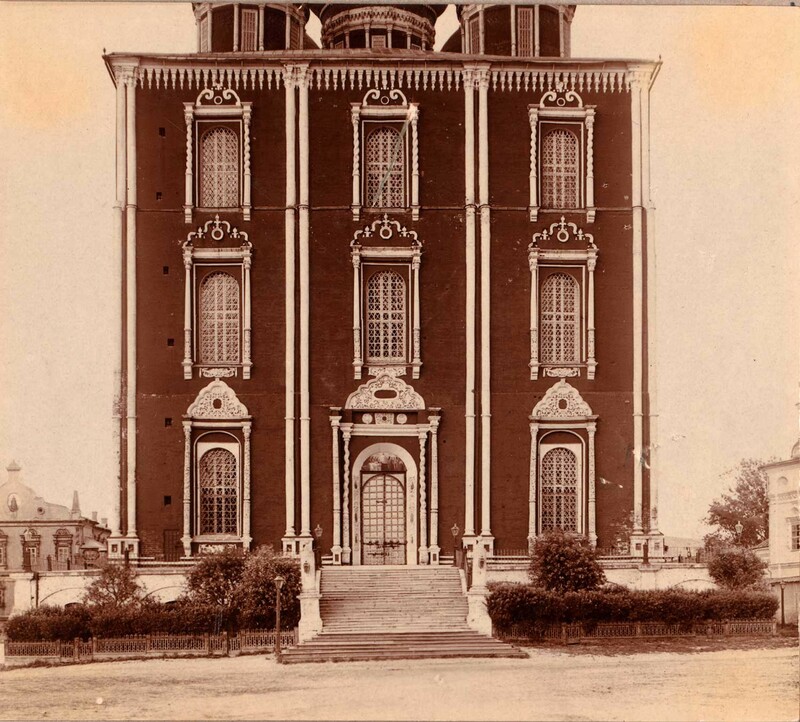 Although preserved only in a contact print, Prokudin-Gorsky’s direct frontal view from the west conveys with striking clarity the segmented facade design. Ryazan Kremlin. Dormition Cathedral, west facade with main portal. May 13, 1984. 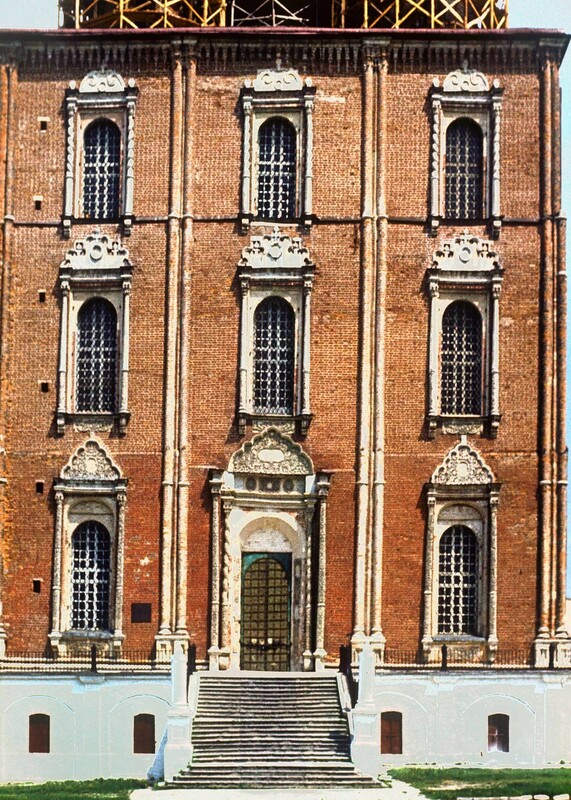 The window surrounds and the paired brick columns (painted white) that vertically divide the brick facades provide a palatial ambience to one of the largest churches of the 17th century - larger, in fact, than the Dormition Cathedral in the Moscow Kremlin. 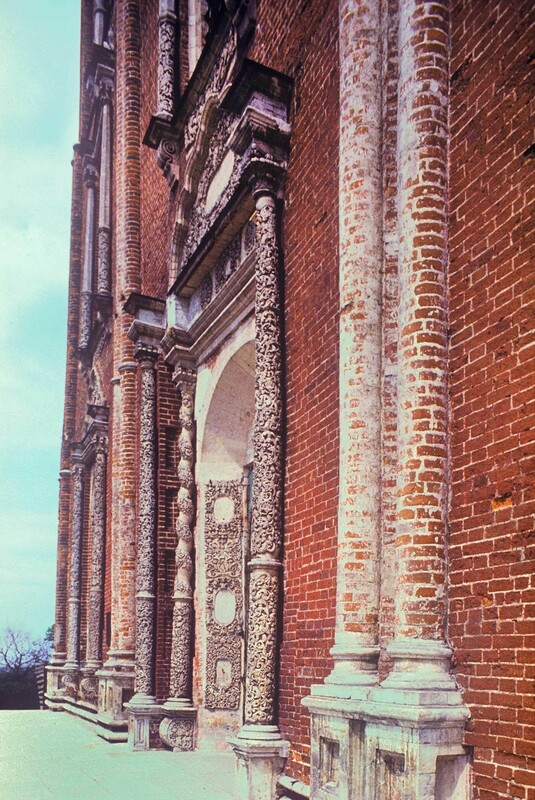 Prokudin-Gorsky’s detailed photographs and mine convey the vivid contrast between the white ornamental trim and the red brick background. Ryazan Kremlin. Dormition Cathedral, west facade. 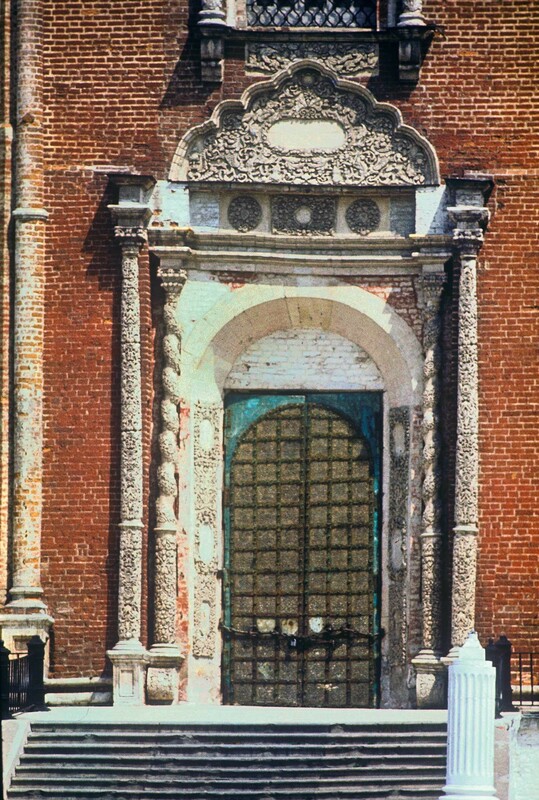 Main portal. May 13, 1984. Closed in 1929, the Dormition Cathedral was used for archival storage and in the 1960s began to function as a museum. Services resumed in 1993, and in 2008 the cathedral was formally returned to the Ryazan Diocese. To the west of the cathedral at the edge of the kremlin stands the enormous bell tower, built over a half-century from 1789 to 1840. At least three architects were involved in its construction, including Andrey Voronikhin, one of the major architects of St. Petersburg at the beginning of the 19th century. Prokudin-Gorsky’s contact print - and my photographs - give an idea of the scale of the bell tower in relation to other kremlin structures. The contrast between the Neoclassical bell tower and the decorative mannerism of the Dormition Cathedral provides an exemplary view of the dramatic changes in Russian architecture over the long 18th century. Ryazan Kremlin. Dormition Cathedral, east view. August 28, 2005.